UK, 2010, 129 minutes, Colour. Jim Broadbent, Lesley Manville, Ruth Sheen, Peter Wight, Oliver Maltman, David Bradley, Karina Fernandez, Philip Davis, Imelda Staunton. Same old, same old - Another Year with Mike Leigh. Another fine Mike Leigh portrait of real human beings, one of his best. While Leigh has made tough and challenging films like Naked, and, surprisingly, a portrait of Gilbert and Sullivan (Topsy Turvy), it is his films about families, especially Secrets and Lies, All or Nothing, Vera Drake and, now, Another Year, that reveal his understanding of human nature in its ordinariness, in the houses next door in our suburbs. There are four parts to the film, each season labelled (and photographed with different shades and lighting) as we see Gerri and Tom work in their allotment garden, reminding us of sowing, ripening and harvesting. There is a wonderful opening sequence with a depressed housewife suffering from insomnia, interviewed by a pregnant doctor and then, quite unwillingly, speaking with a therapist. The woman is played by Imelda Staunton (Vera Drake) and it is pity that we do not see her again. She is a means of introducing the counsellor, Gerri (Ruth Sheen who has been in several Leigh films but shines here in a central role). Gerri is married (40 years) to engineering geologist Tom (a forthright but benign Jim Broadbent who was W.S.Gilbert in Topsy Turvy). And, in case you are thinking it, Tom remarks that they have got used to the Tom and Jerry quips over the years. Because Gerri and Tom are meant to be representative of most people in their type and in their good-natured treatment of people, it seems right that the types should belong to the groupings that is more numerous in society. Tom has a science and engineering background. His career has meant quite a deal of responsibility which he has lived up to. He is also direct in his encounters with people, with an underlying sympathy, though able to stand back and deal with situations and people more objectively. This is the way that he deals with his wife's associate, the clinging and self-pitying Mary. It is the way that he deals with his son, a solid family relationship and friendship. It is the way that he deals with the funeral arrangements with his brother, Ron. Tom is a good man, dependable, solid. Gerri, as we see from the outset, is a counsellor. She is also a devoted wife and mother, a dedicated provider who appreciates company and friends, going out of her way, though this can be most trying, to listen to and help her friend, Mary. She welcomes visitors, responds well to her son's girlfriend. She is considerate, allowing herself to become involved in other people's problems while not taking on their burdens for them. She is a good woman, also dependable and solid. 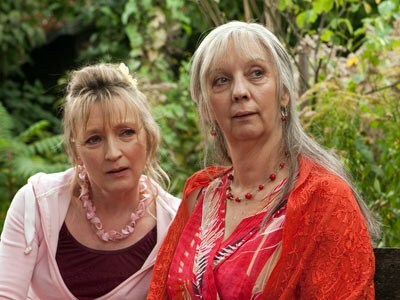 For a substantial part of Another Year, we see Gerri in her dealings with long-term friend and office secretary, Mary (Lesley Manville in a tour-de-force performance as an unwillingly ageing, lonely and drinking woman prone to unrequited flirting) and we see Tom with his drinking and greedily over-eating friend, Ken (Peter Wight), who has nothing in life except his job. Gerri and Tom are also good parents and relate well to their son, Joe (Oliver Maltman), and his eventual fiancee, Katie. Mary’s antipathy towards Katy is palpable because she has developed in her emotional neediness and imagination a crush on Joe. Not so easy to pick Mary's type. She is certainly outgoing, dependently so. But, she has not been able to sustain a relationship or has driven potential partners away. She is not a decider at all. She longs for satisfying her needs in the present with somebody sympathetic. Mary and Tom can only fulfil this longing by friendship. Mary needs deep and intimate love. Most people (and the audience in their admiration for Lesley Manville''s performance) respond with frustration and exasperation. The dialogue, created by the cast in rehearsal and then carefully crafted by Leigh, is like life and often very moving. While we praise Mike Leigh for his insights, after all it is his film and he has controlled how it has evolved, it is a tribute to the insights of the cast and how they have interpreted the characters Leigh puts before them. Frequently, they do not know how the rest of the screenplay is to develop. Leigh urges them to experience life and its unexpectedness. So, they draw on their own awareness of human nature to develop the lives of their characters. That Ruth Sheen, Jim Broadbent and Lesley Manville have created such real characters that ring true, shows their deep humanity as well as their acting talent. And to see such genuinely and unobtrusively good people like Gerri and Tom on screen is really heartening and shows Leigh as a film-maker, not just of themes of unhappiness and failure, but of hope and joy as well. The exuberance of Sally Hawkins in Happy Go Lucky was not quite a one-off. 1. A Mike Leigh film, visual style, topics, humanity? 2. The four seasons, the captions, the visuals for each season, the warmth, the cold? The musical score? 3. The title, a happy new year or a sad new year, the same old, same old? The positive emphasis of the film, despite the people with problems? 4. The introduction to Janet, setting the tone for the film, her insomnia, wanting pills, depression, abrupt and monotone answers, her stress, not wanting to talk? The pregnant doctor and her concern? The human condition? Her going to Gerri, not wanting to reveal herself, not happy, wanting a new life? 5. Tom and Gerri, the couple, married for forty years, their love, being comfortable together, working on the allotment with the vegetables, coming home, ease at home? The back-story given at the end, meeting at university, the first day, study, Tom’s two years in Australia, Gerri coming out, the seven months travelling through Asia and Europe? His being a geological engineer? Gerri as a counsellor? Their good relationship with their son? 6. The office, the pregnant doctor, Mary as secretary, her talk, wanting to go for a drink with Gerri? Gerry complying? 7. The portrait of Mary, her life over the years, her age, her memories, her wanting to have a man in her life, young and divorced, bitter about the men leaving her? Her needs, alone, loneliness, drinking, talking to Gerry, saying she was a good listener? Twenty years working in the clinic? The visit to Tom and Gerri, the meal, her behaviour, chatter, eating, drinking, staying the night, meeting Joe? The car, buying the car? Tom and the party, her being late, lost in the car? Her blather? Ken and his advances, her rejecting him? Joe and the memories of the past, as a boy? Her flirting with him? Talking with Tom and Gerri, their coping, helping, patience? Her meeting Katie, her rudeness, Gerri upset? Her turning up at the end, the various stories about her car, getting the twenty pounds? Meeting Ronnie, talking, having the tea? Her being distraught, Gerri being stern with her, inviting her to the meal, meeting Katie again? Sitting, more oblivious of the table talk, the focus on her eyes, alone, life passing her by? 8. The portrait of Tom, at home, at the allotment, comfortable with Gerri, his hard-hat work, testing the soil? Cooking, Mary’s visit, listening? Patient, wry? Good-natured but blunt? Eye contact with Gerri? His concern about Joe and his getting married, grandchildren? Joe’s friends and their weddings? The seasons, the barbeque, his friendship with Ken, Ken eating and drinking greedily, the listening to Mary in the car? Katie, happy with her as a prospective daughter-in-law? Ron, arranging the funeral, the few people, offering Ron to come to London? At the crematorium, with the minister, at home, with the guests, Carl’s arrival, his rudeness? Working in the allotment in winter? Katie and Joe happy? A happy family? 9. The portrait of Gerry, a good woman, big, strong? As counsellor, with Janet? Mary, her patience, having the drink? The twenty years? At home, Mary’s visit, getting her to stay the night? The barbeque, Ken’s arrival, Mary coming again, the rudeness towards Katie? Her pleasantness towards Ron, with the mourners at the funeral? Finally being stern with Mary, the happy ending and the kindness of her embrace? 10. Joe, a good son, relationship with his parents, the Indian clients, explaining things to them? His visits home, encountering Mary, his friendship with her, her flirting with him? The prospect of marrying, his friends’ weddings, Ken? Katie, the introduction to the family, the story of their meeting, happiness? His presence at the funeral? The last visit and Katie being at home? 11. Ken, his age, coming on the train, the past, Derby and the football, friendship with Ron, his eating on the train, drinking, approaching Mary, her repelling him? 12. The golf day, the play, happiness, Jack and Ken? 13. Katie, her job, bright, at ease with the family, rolling her eyes about Mary? Fitting into the family? 14. Ron, taciturn, the death of his wife, yes and no answers, his strained relationship with Carl, friendship with Mary and listening to her? 15. Carl, the background of alienation from his family, late arrival, his rudeness at the funeral? 16. A portrait of life, human nature?